The lightbulb went off. Yoo was not NerdWallet’s COO (as she had first thought), but its final candidate — and Chen had paired the two so they’d bond and hopefully sign together. They did. At the time, Thinh had interest from many of Silicon Valley’s tech giants. The Zynga alum had expertly guided the gaming company through hypergrowth, as it scaled from 40 to over 3,000 people over four years. So how did NerdWallet, the only bootstrapped startup (at the time) on her list, nab this star Silicon Valley people ops leader? At First Round’s CEO Summit, Thinh, now NerdWallet’s VP of People Operations, answered that question by outlining what distinguishes an exceptional Head of Recruiting as well as how to design and refine a magical candidate experience. Any startup that is seeking to dazzle and close the best talent will benefit from Thinh’s hard-won recruiting lessons culled from nearly two decades of experience. Think of it as a movie. Sell candidates on their contribution to a grand story, not their lines in the script. Compelling delivery: Did they recite a checklist of what the company does or did they get you excited about the problem they are solving? Authentic human connection: Do you feel emotionally engaged and invited to play a role in their story? Hunger to win: How do they approach their competition? What is their plan to own the market? How is this person going to help me navigate growing the team? Do we have hiring blind spots as a company? How are they going to help us uncover and address them? How are we affected by departments rounding out their teams? How should we be structuring our hiring process to remain competitive? Generating real, human connections is a recruiter’s first and last job. For any company — especially for startups — hiring is long and strenuous. Your head recruiter’s ability to structure an interconnected sourcing, interviewing, and closing process is critical. This is how Thinh and her team do it at NerdWallet and what she recommends to those in her profession. Being trusted by and transparent with candidates means giving context before it’s requested. Respect your candidates by acknowledging all of their needs. Be relentless about eliminating friction. Always go out of your way. This is the guidance that Thinh would impart if she could only give one piece of advice about recruiting. Thinh estimates that 40% of the candidates who they meet with aren’t actively looking for a new role. They start as casual conversations until the team of Nerds goes out of their way to further engage passive candidates. Find your threshold between speed and haste. At NerdWallet, the team has a SLA to respond to referral candidates within 48 hours — throughout every part of the process. Always keep your candidates moving through as frictionless of a cycle as possible, whether it’s scheduling a phone screen or getting in touch with a referral. What is your framework for evaluating this decision? Who are you making the decision with at home? How would you rank the different elements of your decision? On a scale of 1 to 10, where would you rate your ability to say yes right now, with 10 being a resounding yes? If you aren’t at a 10 yet, what is holding you back? What can we do to get you to the finish line? Your recruiting process is your sword and shield. Sharpen it regularly. Wield it wisely. 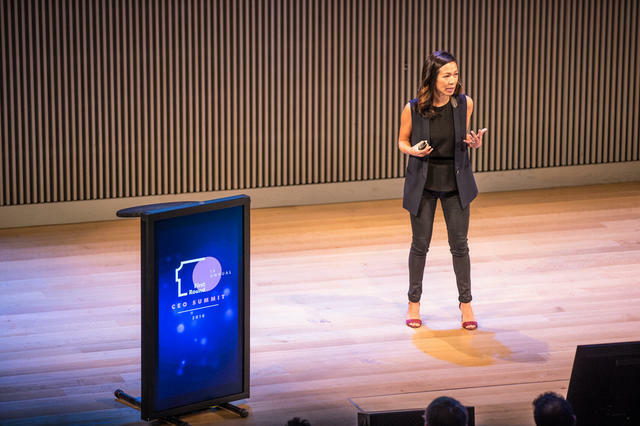 The month Thinh spoke at First Round’s CEO Summit, she noted that there were 12,700 software engineer positions open in the Bay Area, plus 7,400 product manager positions, with an average of 1,500 being added every day. How can early-stage, cash-strapped startups stand out among giants like Apple or Facebook when trying to fill these roles? First, follow Thinh’s tips to help find and hire a capable Head of Recruiting. Look for the storytelling detective who can as easily pitch her last company with nuance and ask the right questions to equip her to pitch your startup. Then find and pull the levers to create a magical candidate experience: Always go out of your way and sweat the details. Frontload the conversation about compensation. Conduct dual auditions. Find your balance between speed and haste. Always look to refine your process.